Hey there! Thanks for poking in. 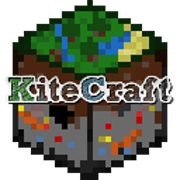 We're a small Minecraft server called "KiteCraft". We've been around since 2010, and are currently working towards building our community even further. The server has around 200 total members, and 30 who regularly play. People say KC is one of the best communities they have ever played on, and want to see us grow. We're working towards building a better MC Server environment, and hope to be a place everyone enjoys. So come see the server, we don't bite (hard).